Compared to proprietary wireless control systems currently available, our customers can control their own systems, and not be at the mercy of their vendors’ abilities and interests in maintaining closed systems. 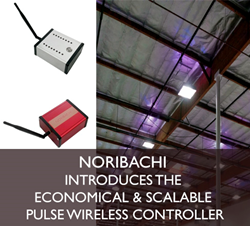 Noribachi, a leading U.S.-based custom LED manufacturer for high output commercial and industrial lighting solutions, is proud to introduce its new Pulse Wireless Controller. The Pulse Wireless Controller uses an open-source Arduino-based mesh network and the Zigbee protocol to connect individual lights to a central control system using an FCC approved 900 MHz frequency. It is a self-routing, self-healing network for high reliability and low latency. Each Pulse can be its own closed system, enabling multiple Pulse networks to be in use in a single facility. In addition, they can be daisy-chained for connecting hundreds of lights. Look for future versions of this product to allow additional control capabilities. These can include various analog and digital sensory inputs, which communicate with the central controller using a high bandwidth wireless connection. The Pulse Wireless Controller is available on all of Noribachi’s Bespoke Engineered and Specifically Tailored (BEST) LED fixtures as well as existing LED lighting solutions. For more information about Noribachi’s new Pulse Wireless Controller, visit http://www.noribachi.com or call 855.283.1100. U.S.-based Noribachi is a leading custom LED manufacturer for high output commercial and industrial solutions. Noribachi applies a Bespoke Engineered and Specifically Tailored (BEST) methodology to deliver unlimited LED light applications. Noribachi is dedicated to improving the light industry by incorporating design and technology to our BEST lighting solutions. For more information, visit http://www.noribachi.com.